The Forum Overview widget shows a list of all available forums in The Forum Module. If you click on a forum from the list, you directly go to the forum page and see all the topics in the forum. Only the active forums are visible; you can also see in which categories they are classified. 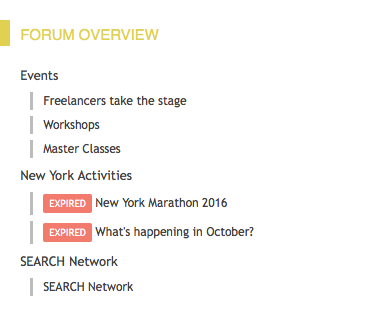 So members can see in one glance what the active topics are and in which categories they are. Search for the Forum Overview widget and select Edit at the Options drop-down.